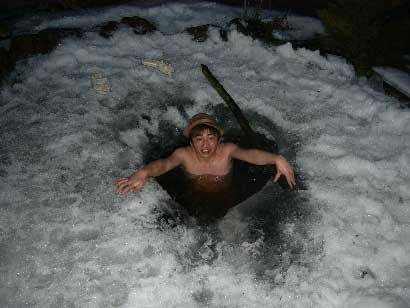 Me in a frozen pool in front of Prof. Raudys's home in Vilnius, Lithuania in March 2003. The 2nd International Workshop on Subspace Methods(SS2009) A program committee member. Third International Workshop on Camera-Based Document Analysis and Recognition (CBDAR2009) A program committee member. International Workshop on Computer Vision and Its Application to Image Media Processing (WCVIM) A program committee member. The 3rd Pacific-Rim Symposium on Image and Video Technology 2009 (PSIVT2009) A program committee member. The 8th International Workshop on Document Analysis Systems (DAS2008) A program committee & organizing committee member. Second International Workshop on Camera-Based Document Analysis and Recognition (CBDAR2007) An organizing committee member. Meeting on Image Recognition and Understanding 2006 (MIRU2006) Program for Young Researcher An organizing committee member. First International Workshop on Camera-Based Document Analysis and Recognition (CBDAR2005) An organizing committee member. The 8th Pattern Recognition/Media Understanding Society Algorithm Contest An organizing committee member.